Haimanti Roy specializes in the political and social history of colonial India and modern South Asia. Her first book, Partitioned Lives: Refugees, Migrants, Citizens in India and Pakistan, 1947-65 (Delhi: Oxford University Press, 2012) examines issues of territoriality, identity, migration and citizenship, and the subsequent re-ordering of national identities of ordinary men and women in post-Partition India and East Pakistan (present day Bangladesh). Her second book, published in 2018, is a short introduction to the Partition of India which is part of the Oxford India Short Introductions series. 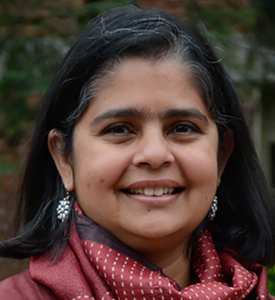 She is currently working on a social history of travel certificates and identification documents and their implications for framing citizenship in twentieth century India. Roy has previously taught at the University of Cincinnati, Massachusetts Institute of Technology and at Georgia Institute of Technology. At the University of Dayton, she teaches courses on Gandhi, The British Empire, Religion and Politics in South Asia and core courses for History Majors. She can be reached via email at hroy01@udayton.edu. Partitioned Lives: Migrants, Refugees, Citizens in India and Pakistan, 1947-65. New Delhi: Oxford University Press, 2012. "A Partition of Contingency? Public Discourse in Bengal, 1946-47," Modern Asian Studies, 43:6, (2009): 1355-1384. Book reviews in The Economic and Political Weekly, Journal of Asian Studies, Contemporary South Asia, Journal of British Studies, and Biblio.